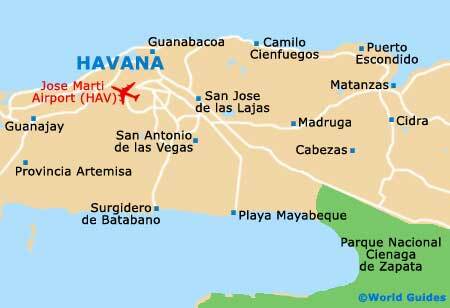 Havana is the best place in Cuba for checking out tourist attractions. This spreading capital city is simply loaded with historic Spanish-colonial (Gothic and Baroque style) structures and boasts a UNESCO World Heritage registered old town area, known as Old Havana (Habana Vieja). Everyone heads for the El Malecon promenade and the old town, the latter being home to Central Park (Parque Central) and an exciting street market. The Cemetario de Colon provides a quieter alternative to Central Park, while the Partagas Cigar Factory and the National Aquarium (Acuario Nacional) are two must-dos for sightseers in Havana. Very close by, both the outlying National Zoological Park (Parque Zoologico Nacional) and the National Botanical Gardens (Jardin Botanico Nacional) make for enjoyable days out. There are a number of walking tours available in Havana, covering different aspects and areas of the city. The Habana Vieja Walking Tour is especially popular and starts at the Restaurante El Patio on the Plaza de la Catedral. From here, you head southwards to the Plaza Vieja, passing many attractions on the way. In order, these include the Catedral de San Cristóbal de la Habana, the Taller Experimental de Grafica, the Museo de la Cuidad, the Palacio del Segundo Cabo, the Hotel Ambos Mundos (favoured by Ernest Hemingway), the Maqueta de La Habana Vieja, the Hostal Condes de Villanueva and the Museo del Chocolate, as well as numerous cafes. The Habana Vieja Walking Tour covers roughly 1.5 km / 1 mile, and a leisurely stroll should take between two and three hours, allowing for sightseeing. If you would like to learn about the architecture of Havana, then join the Centro Habana Architectural Tour, which takes in many of the city's most impressive and imposing buildings. Starting at the end of the tree-lined Paseo de Marti (El Prado), this walking tour leads you southwards towards the Parque Central, and passes the Teatro Fausto, the Casa del Cientifico, the Hotel Sevilla, the Edificio Bacardi, the Centro Asturianas (part of the Museo Nacional Bellas Artes), the Capitolio Nacional, the Teatro America, the Malecon and the Centro Hispano Americano de Cultura. The Centro Habana Architectural Tour is around 4 km / 2.5 miles in length and should last approximately three to four hours. El Malecon is the famous 8-km / 5-mile promenade that runs along the shoreline to the north of Centro. Locals come here to fish and stroll, while tourists enjoy walking alongside the palms and enjoying the views of both the seafront and the crumbling buildings behind. The Malecon dates back to the early part of the 20th century and this thoroughfare is especially fun on weekends, as it gets rather busy and is awash with cafés and bars. Amongst the Malecon's many attractions is the towering Hospital Nacional Hermanos Ameijeiras, the Monumento a Antonio Maceo and the Torreon de San Lazaro watchtower. Old Havana is situated just across from Centro (east) and is perfect for a wander, along with El Malecon, and is home to many of the city's top sights. This neighbourhood is packed with character and comes with bags of museums, shops and eateries, and plenty of classic hotels and colonial plazas. Central Park resides here, along with the pedestrianised Calle Obispo and the lively Calle Tacon street market. A real haven in the city, the Parque Central offers an important place to escape the traffic and city noise, growing to its present-day size in the latter part of the 19th century, following the removal of the city walls. Central Park is based within Old Havana and is the main park to head to for relaxation and a picnic. The park lies at the western edge of this historical district and is on par with El Malecon for people-watching. There are museums, colonial buildings, top hotels and walking paths galore. Particularly notable is the Jose Marti statue, the Centro Gallego, the 2000-seater Gran Teatro de La Habana (Grand Theatre), and the very unusual Esquina Caliente - a corner where crowds gather to debate baseball. Acuario Nacional is the top attraction to take children to while in Havana. This revamped aquarium is a perennial family favourite, with its large tanks and dolphin shows, and has been around since the 1960s. There are also sea lions at the National Aquarium, along with many varieties of saltwater fish. Dolphin shows take place every hour from 11:00 to 21:00, and visitors will be pleased to learn that there is a restaurant onsite, should you require a bite to eat. Lying on the south-western side of the city centre is this beautiful area of Havana, the Cemetario de Colon. This enormous series of cemeteries covers around 125 acres / 50 hectares and is loaded with mausoleums, gravestones and crypts, as well as many intricate sculptures and memorials. The Cemetario de Colon is a good alternative to the city's main parks for escaping the sun. Serving as the commercial hub of the city, the Vedado area is especially historic and does come with a number of appealing attractions, such as a cluster of art-deco skyscrapers and some very upmarket accommodation, provided by hotels such as the Habana Libre and the Hotel Riviera. It was at the Habana Libre (formerly the Hilton), where in 1959, Fidel Castro based himself and ruled Cuba, determined to rid this district of its mob-connections and gambling. One of the most distinctive buildings within the Barrio El Vedado is the 39-storey Edificio Focsa, which was completed in 1956 and is considered to be one of Cuba's modern-day engineering wonders. At the top of the Edificio Focsa, the La Torre restaurant provides fine dining with quite a view. Although it is fair to say that most tourists don't come to Havana to see its zoological attractions, a day at the National Zoo is worth considering, particularly if you are holidaying here as a family. The Parque Zoologico Nacional is located on the southerly outskirts of the city and features hippopotamuses and rhinoceroses in spacious paddocks, while other animals live in smaller enclosures and cages. A trolley bus provides a pleasant and easy way to tour the grounds. Of interest to golfers, the Habana Golf Club is only a matter of minutes away. The National Botanical Gardens of Cuba lie to the south of the city, being just a short distance to the east of Jose Marti International Airport. Covering an immense 1,500 acres / 600 hectares, the gardens contain large and important collections of exotic plants, trees and flowers, some of which grow in vast glasshouses. Landscaped areas include a Japanese Garden with oriental features, seasonal flower borders and plenty of seating. Guided tours are available onboard a land train, allowing you to see the main horticultural attractions and gardens within approximately two hours.